For the longest time I listened to my friends talking about their children. I was pleased for them that their offspring had achieved some mediocre milestone, of course I was, but I never really understood the level of enthusiasm with which the news was relayed. Your child has started to walk? Well done, it must be a relief to know they won’t be crawling into the office on the first day of work. Your child has teeth? I can understand your glee, it’s a rare occurrence to have a full complement in your postcode. Your child managed to play with another child without exposing brain matter over a £3 toy? Congratulations, you’re not raising a complete psychopath after all, I had wondered. Even having children of my own I have often struggled to understand the competitive glee that some parents have in describing the latest “accomplishments” and you know why that is? It’s because I’m an adult and therefore I had forgotten that all these milestones are really hard fought. When you sit on the floor watching your child taking those first faltering steps you realise that being a biped is actually really difficult. Especially when you think that about 30% of their weight is at totally the wrong end of their body to give them stability. You watch the determination of your child as they hit the dirt time after and time and carry on pulling themselves up and actually I start to admire that level of dedication. I don’t think I've worked as hard on developing a new skill for several decades. When you feel your child clutch your body because they feel like their mouth is being ripped apart by a pain they don’t understand it is humbling. I understand now that what I once thought of as bragging is actually just sheer bloody relief that their child is now feeling human again and everyone can resume a life where eating and sleeping are not banned activities. And finally the thorny subject of social skills; thorny because my son has been one of those who has needed a lot of help to understand the limitations of acceptable behaviour. There is nothing, I mean nothing in this world that tests your resolve like a toddler who is hell bent on injuring someone for absolutely NOFUCKINGREASON other than they are a toddler. It’s hard to keep faith in positive parenting when what you want to do is grab them by the shoulders and shout “why can’t you just be NICE?!?”. There are so many concepts that we, as adults, take for granted. So much that you assume. It took me the longest time to realise where I was going wrong when I was trying to stop negative behaviour. It totally slipped my mind that saying “no” was an entirely pointless thing to do to a child unless you are going to tell them what constitutes “yes”. I often wonder how many children feel like that when they are getting a royal bollocking for something they’re doing wrong. 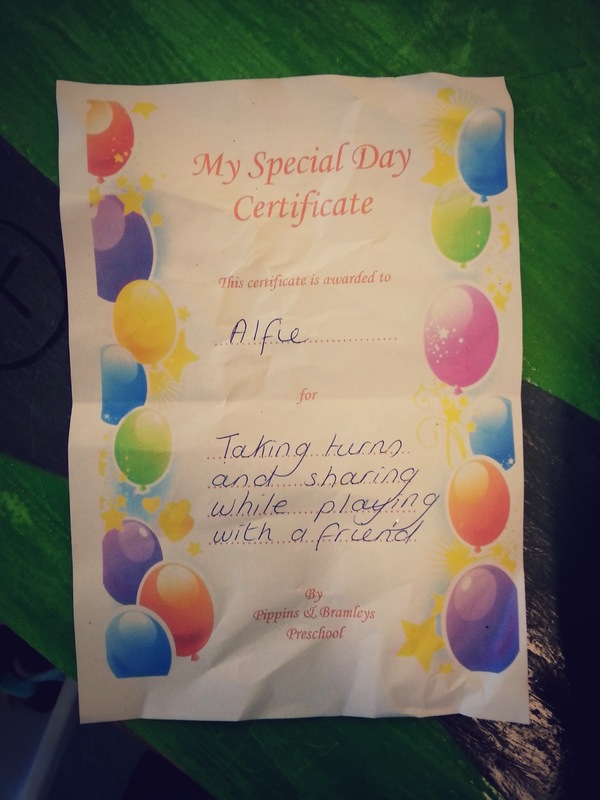 We made that mistake with Alfie when we were trying to stop him mowing down other children. For reasons known only to him he decided one day that saying hello was best done by running at another child and chest bumping them. We were all over that behaviour, getting him to step back, telling him that it wasn't nice to do that and making him apologise but what we singularly failed to do, until another mum at toddler group did it for us, was to give him another option. I will be forever grateful to this mum who scooped up her flattened, bellowing toddler, took my son by the hand and said “Alfie, it’s not nice to say hello by knocking someone over. When we want to say hello we wave, like this”. I can't remember ever feeling as stupid as I did that moment. How could I have missed something so fundamental? Well because I'm an adult, and I had forgotten that I'd had to learn what to do as well as what not to do. Since then I have been super conscious of making sure my children have both options made clear to them and I’m super aware when other people don’t do the same. It doesn't mean my children always choose the option I would like them to choose, but then that’s the job of a toddler, and why the good lord invented sleep. As depressing as it is to repeat yourself for the 500th time and feel like you're getting nowhere, sometimes you receive an email like this and the world seems a brighter place.